This title is a major enlargement of Israel: Past, Present, and Future, which was published in 2010. Jews in Fighter Jews covers the past 2,500 years of the history of the most important and amazing nation on earth, the only nation directly created by God and called by God “my people,” the nation to whom “were committed the oracles of God” and “of whom, as concerning the flesh Christ came” (Romans 3:2; 9:5). The author has been studying Israel for nearly 45 years and has visited Israel multiple times, traveling from the Red Sea to Mt. Hermon. For starters, I have traveled the entire length of the Jordan River, taken a boat entirely around the Sea of Galilee, observed the Plain of Megiddo from a hot air balloon, and gone to many places where tourists never go. I’ve interviewed Netafim engineers and Biobee representatives, toured banana, mango, and dairy farms, visited many of the kibbutzim and a great number of Israel’s museums. Israel is still in apostasy today, but her conversion is on the horizon. When I visit Israel, I feel as if the whole place is vibrating, as it were, in the anticipation of the fulfillment of prophecy. The stage is set! Israel Past: 2,500 Years of Fulfilled Prophecy. This section covers the Assyrian captivity, the Babylonian captivity, the Syrian wars (the Maccabees), the Jewish-Roman wars (AD 70 and 135), the Emperor Hadrian’s role in attempting to eradicate Israel, the 2000-year Diaspora, including Hitler’s Final Solution Synagogues, the Talmud, and Kabbalah. Israel Present: The Modern State of Israel. This section covers the amazing Ezekiel 37 prophecy of Israel’s return to the land in a spiritually-dead condition. We cover the prayer movement of the 19th century for the return of Israel to her land, the Zionist movement, the kibbutzim, the Balfour Declaration, the fall of Palestine to Britain, the British Mandate, the Haganah, the founding of the state of Israel, the War of Independence, the Six-day War, the War of Attrition, the Yom Kippur War, the intifadas, Israel’s modern military, national development, technological prowess. Israel Future: A Prophetic View. This section covers false Messiahs, the Antichrist, the Third Temple, the 144,000 Jewish evangelists, the Two Witnesses, the battle of Armageddon, the conversion of Israel, the New Covenant, the Regathering, the Millennial Temple, and Christ’s glorious kingdom. 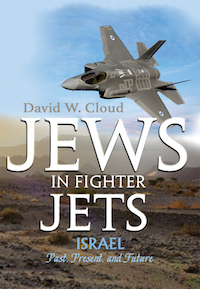 Jews in Fighter Jets is a package consisting of a 555 page book and a series of 16 PowerPoint presentations packed with more than 2,670 high quality color photos, drawings, historic recreations, and video clips. Keynote presentations (for Mac and iOS) are also available. Book: Softcover, 555 pages, 5.5 x 8.5 in. Download: eBook with Powerpoint or Keynote files. You'll select Powerpoints or Keynotes on the download page. Your download link will be in your receipt email. If you don't have it within 5 or 10 minutes check your junk mail.